Rover isn’t feeling too well. I do not know just how serious this might be, or exactly what’s wrong with him. He is somewhat lethargic and is making this lowing sound, as would a cow. Pete put a second door on the goat house. I opened it. He laid in the old hay as I did some TTouches. A part of our conversation follows. A: Can you tell me what the problem is? A: Where do you hurt? Ranger (walking past): He feels like crap. A: Is it okay if I keep asking you questions? A: I see that you are having a hard time standing. And you aren’t eating your hay. R: Hang out with me. I enjoy your company. Always have. I like the ear slides and the flank rubs. A: Look! You’re coughing up and chewing cud! A: Rover, I’m worried about you. I don’t want to lose you. R: Stop worrying and enjoy my company while I’m here. A: I can’t imagine life here without you. R: Just be happy to have me here, now. Look, the morning sun is coming over the mountains. A: It will warm things up some. R: Yes, when there’s again heat in the sun it means that it will soon be spring again. A: Is there anything I can do to make you more comfortable? R: What you’re doing right now is just fine. 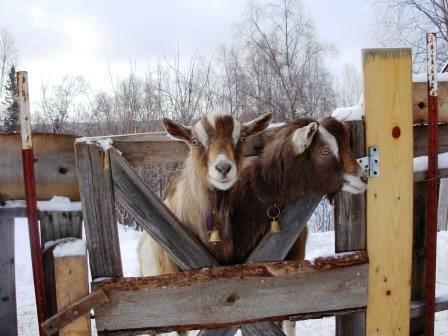 A: Northstar Animal Hospital has an on-call veterinarian who works with goats. Or we could see if Dr. Zach, our regular veterinarian can do a home visit. R: If he can make me feel better. It would make you feel worse if he suggested you have me put down. A: I have no idea what the outcome might be. R: I like Zach. I’d be up for a visit if he’d do as you’re doing and sit with me and rub my ears and flanks. A: You know Rover, veterinarians are very busy people. R: How come they’re so busy? A: Because there are more sick animals out there than there are veterinarians to care for them. R: How come there aren’t more veterinarians? A: Because you have to be smart and willing to work very hard for very little money. R: How come you aren’t a veterinarian? A: Because I’m not science smart. R: You’re hard working. It might take you some time, but you could figure things out. A: If I went to veterinary school, I would not have time to tend to you, Ranger, the chickens, dogs, or horses. R: How long would you be in veterinary school? A: It would require an additional four years of school on my part. R: That’s a long time. Ranger (walking back the other way): Get up dude. Dog’s in the house. Hay shed is open. Time to make our move. A: Ranger, get the hell out of here. R: I’m feeling a little better. I would like to walk around a bit. A: I’m so glad to hear this! R: Life is good, isn’t it? A: Yes Rover, life is very good.